With so many long-winded, time-consuming RPG’s in the world, it can be daunting to start any of them with the busy lives we live. If only there was an RPG that trimmed off the unnecessary fat like grinding or long side quests. Well, perhaps there is, in Heroes Trials. 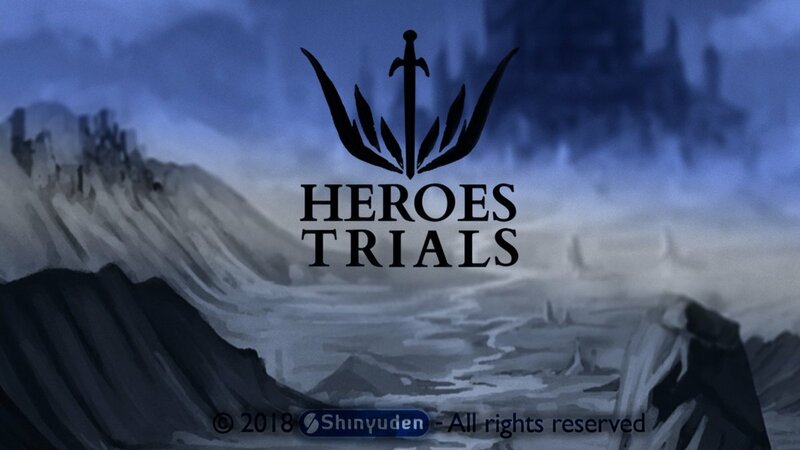 Developed by indie developer and publisher Shinyuden, Heroes Trials released on PC back on June 20, 2018. It has now seen a new lease of life as it has now been ported to consoles including Xbox One, PS4 and Nintendo Switch, courtesy of Indie Publishing and Porting company, Ratalaika Games. The story follows two siblings; Zoel and Elia, who along with other people in their village are summoned by the principal of the Heroes Academy to compete in the Heroes Trials. The Heroes Trials consist of a number of missions that have to be accomplished in a set amount of time. The two siblings set off together much later than everyone else after falling victim to a sleeping spell that was conjured by one of the other participants. After completing all of the trials, Zoel and Elia will be titled ‘Heroes’ of their homeland. It is a simple plot that sets the wheels in motion and gives the player just enough to go on. There is a plot twist as to be expected, to give the game a bit more depth. It’s not a hugely compelling story that will be winning awards anytime soon but it at least gives you a general idea of what the game is about. Heroes Trials is a single player, top-down adventure game. You take control of the two main protagonists; Zoel, the Sword wielder and Elia, the spell caster. You can swap between characters at any time by pressing the X button. Zoel can do more damage but has to be in close range of the enemy. Elia can cast spells at range but they are much weaker than her brother’s attacks. You can attack by using the B button. Pressing the button will unleash a single one directional attack. Holding it down for a while and then letting go will administer a spin attack to damage enemies in any direction. The Y button responds differently depending on the chosen character. If Zoel is in play, you will be able to throw bombs once you have acquired them. If you are playing as Elia, you will be able to change between spells once you have acquired them. As Zoel, you can also defend yourself with your shield by pressing L.
Though brandished as an Open World game, gameplay is rather linear. You can only access certain dungeons when you have met the pre-requisite of collecting a particular item from a previous dungeon. While you are, free to roam around the main map within the set time limit, If the timer reaches zero before you complete your objective, you will lose any progress you have made after the last time you saved. You can find some items off the beaten path. They are mostly for those looking to earn achievements and unlock trophies. These are all well and good for the Xbox One and PS4 versions of the game but the Nintendo Switch does not have an Achievement system in place, so there is very little benefit in trying to 100% the game. Heroes Trials is like the skimmed version of RPG’ and is trimmed of all fat, so there are no optional side quests. NPC interaction is minimal and there is no levelling up whatsoever to concern yourself with. You can more or less beat the game within a couple of hours if you get stuck but after a couple of playthroughs, you could easily get the time down to less than an hour. You do have to ask yourself though, is unless you wanted to speedrun the game in the quickest time possible, why would you want to go through it all again? There are 13 trials that you must overcome which are broken down into missions. They mainly consist of travelling from point A to point B in a certain dungeon. You will face a number of enemies that you can either kill or just evade. At some points, you find gates that require keys to open them. Other gates may require you to activate a switch using a particular spell like lightning, fire, or ice. Most of the trials have a mini-boss for you to fight against which, upon beating will allow you to collect a special item and start the next trial. Even with the basic RPG elements, it turns out that you can miss what really makes up an RPG. After all, the true adventure is in the journey, not the destination. If you take out what happens during the journey, you are left with quite an uneventful trip that you will never cherish and will soon forget. Heroes Trials was developed using the Unity engine. Graphically, it would not look out of place on a smart device. On console however, it could do with a bit more touching up and refining. It is bright and colourful but there isn’t really anything that, makes you think “Wow” that looks gorgeous. The menus on the other hand, are nicely represented and the font is easy enough to read. As regards to music and sound, I did enjoy the music very much. The soft and endearing instrumental music gives Heroes Trials a certain charm It is reasonably stable throughout the entire game with no drastic change to create impactful moments. The sound effects however, do sound a bit generic at times. Listening to the sound of dying enemies squeal becomes a tad annoying after the umpteenth time. A few things that I didn’t like much about Heroes Trials was that it felt lacking on a content basis. Gamers like to play games they can sink their teeth into, experience and enjoy. Heroes Trials lacks content but after beating the game, I wasn’t left with a feeling of wanting more. It was more of “I came, I saw, I conquered” and the less said the better. I also felt that swapping between using the sword and shielding yourself could have been a bit quicker and smoother. In one room full of enemies, I went to defend myself between swings from the swarm of flying monsters in the first dungeon. I would take damage due the time it takes for one animation to end and the other to begin. The difficulty arc ramped right up within the very first dungeon, especially in the aforementioned room full of enemies. After that moment, the difficulty arc took a complete nosedive. It would only test your gaming skills in the occasional boss battle every now and again rather than start off relatively easy and gradually get harder. For $5.99 you won’t be breaking the bank but you would only get a few hours of joy from it, much like getting a cheap deal menu meal. You are reasonably satisfied whilst eating but after it is gone, you realise that you probably should have spent a bit more and bought something more wholesome than the fast food quick fix you just went for. The music is pleasant but the gameplay is really short. If you really want to play an RPG, don’t cut corners. That juicy fat content filler is what makes the RPG Steak taste so good.